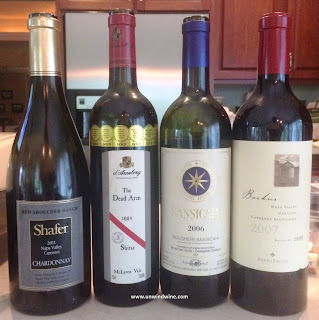 Dr Dan hosted us for grilled steak dinner and opened a diverse pair of premium Bordeaux varietal reds - Joseph Phelps Napa Backus and Super Tuscan Sassicaia. I brought a Dead Arm and Shafer premium Chardonnay to round out the dinner wine flight. Before dinner Dan served shrimp cocktail and a cheese course of swiss and sharp cheddar with an assortment of olives. 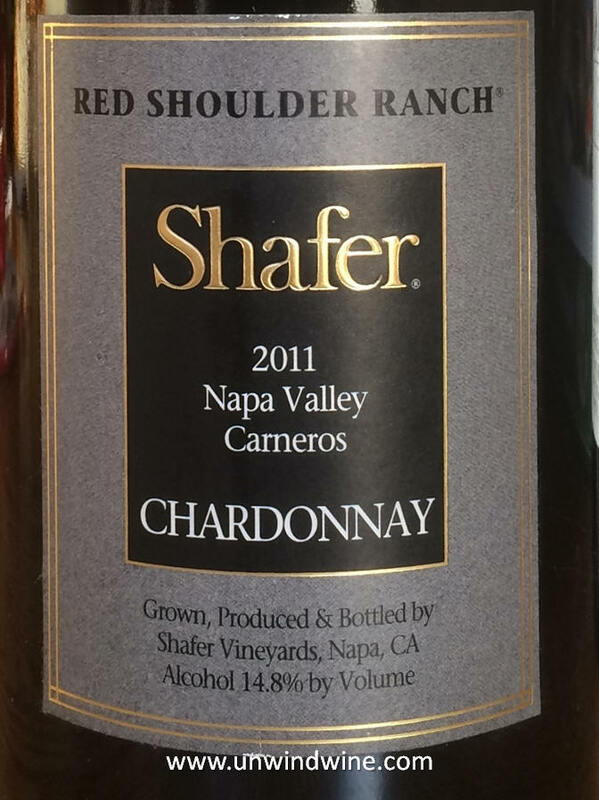 For this course I brought and served Shafer Red Shoulder Ranch Chardonnay as a starter. With grilled New York Strip steaks, Dan served twice baked potatoes, grilled asparagus and portabello mushrooms. The diverse Reds each complimented features of the meal. The grilled steak were an ideal highlight with the Backus while the portabello mushrooms were a perfect match to the Sassicaia. This single vineyard grown Chardonnay is from Red Shoulder Ranch vineyard, located on 68 acres in the Carneros district at the top of San Fransisco Bay where Napa and Sonoma come together at the bottom of Mt Veeder at the foot of the Mayacamas Range that separates Napa from Sonoma. Unlike Napa Valley which is known for its Bordeaux varietal wines, the Carneros appellation, with its cool breezes and fog that rolls in off the Bay, is more suited to Burgundian varietals of Pinot Noir and Chardonnay. The vineyard is named for the the Red-shouldered Hawks who, along with other birds of prey, help protect the vineyard from vine damaging gophers who feed upon the rootstock of the vines. This was straw colored, medium bodied, subtle lemon and citrus accented by tones of apple and pear with nice, well balanced crisp acidity and a clean structured lingering finish. With grilled New York Strip steaks, Dan served twice baked potatoes, grilled asparagus and portabello mushrooms. The diverse Reds each complimented features of the meal. The grilled steak were an ideal highlight with the Bachus while the portabello mushrooms were a perfect match to the Sassicaia. Notably, Joseph Phelps premium labels were the highlight feature wines of Dan's father of the bride celebration dinner - Backus and a vertical selection of Phelps Insignia. 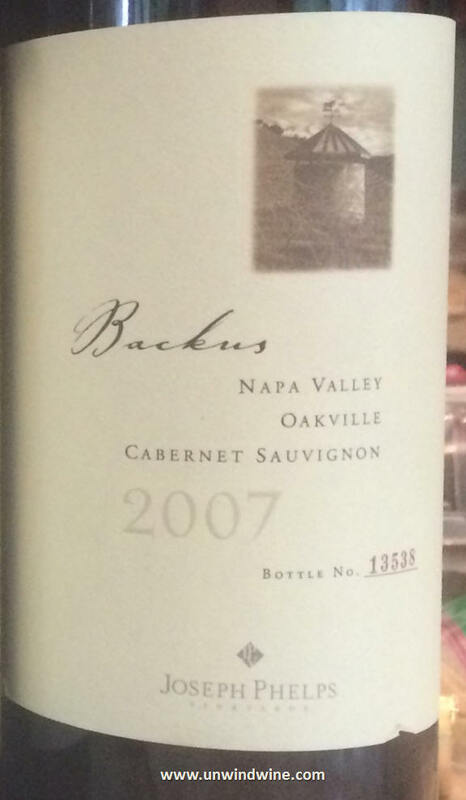 This wine is from the single designated Backus Vineyard in the Napa Oakville appellation, located south of Oakville Cross Road on the east side of Silverado Trail. The vineyard is planted in 20 acres of Cabernet Sauvignon, 1 acre of Petit Verdot, and 1 acre of Malbec. Elegant, silky smooth, polished, a symphony of perfectly balanced flavors, this was the ideal opening red for the dinner course. Dark garnet/purple colored, medium-full bodied, aromatic nose and flavors of a medley of sweet ripe berry fruits accented by slight subtle tones of vanilla, and sweet oak with a whisper of cassis and mocha that are so nicely integrated they're almost indistinguishable in isolation, turning to supple full but silky smooth tannins. 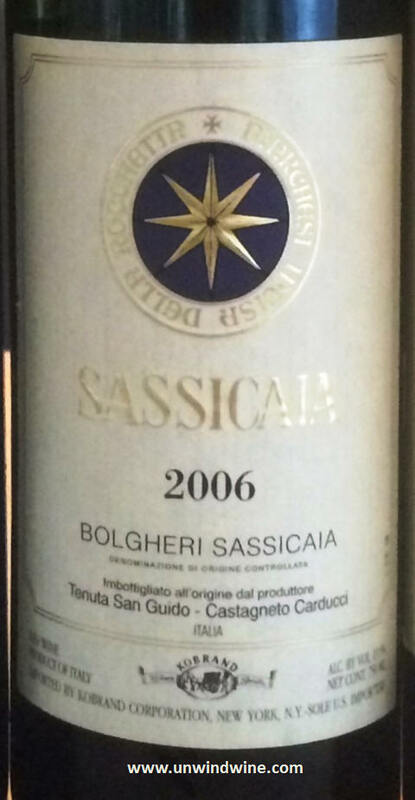 Despite being an Italian wine, this Super Tuscan is a Bordeaux Blend - 85% Cabernet Sauvignon and 15% Cabernet Franc. In fact, the rootstock for the Cabernet was actually sourced from vines from the innumerable Chateau Lafite Rothschild. A very different character and style in contrast to the silky smooth smooth polished Backus. This wine begged for hearty food to balance its firm forward concentrated taste profile. It was best paired with the grilled portabello mushrooms. This was dark garnet colored, full bodied, firm, tight, complex and concentrated black berry fruits accented by a layer of cassis, graphite, smokey creosote and dark expresso, turning to firm tannins on the firm, long, lingering finish. We hold close to a dozen vintages of this label and this vintage is one of the bigger, more vibrant and expressive of many our vintages of Dead Arm. Dark garnet colored, full bodied, rich, thick concentrated, almost chewy, floral, spicy tones of ripe blackberry, black raspberry, with more subtle blueberries and plums, with hints of black pepper and spices turning to structured nicely balanced tannins on a long full finish. While this could stood in for any course of the dinner, the bright vibrant expressive fruit was best suited for the dessert course that Linda brought with dark chocolates, dried cherries, and fruit tarts with kiwi, strawberry, and grapes.